"How I feel about the show right now is quite defiant," says Harington in an Esquire interview, in which he confirms he wears high heels to make Jon Snow look taller. "I think no matter what anyone thinks about this season—and I don’t mean to sound mean about critics here—but whatever critic spends half an hour writing about this season and makes their (negative) judgement on it, in my head they can go f*ck themselves. 'Cause I know how much work was put into this. I know how much people cared about this. I know how much pressure people put on themselves and I know how many sleepless nights working or otherwise people had on this show. Because they cared about it so much. Because they cared about the characters. Because they cared about the story. Because they cared about not letting people down." He adds: "This season, we got kind of philosophical about it all and what it might mean. You know, trying to make sense of these last eight years of what we’ve been doing. For me, really, I felt that the world was the main character. Yeah, you could point to Jon, or Dany, or Tyrion, or Jaime Lannister. You can point to any one of the characters and kind of make your case for them being a lead. And Jon’s definitely in that category." 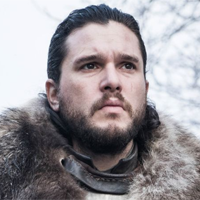 Kit Harington on riding a dragon: "My right ball got trapped, and I didn’t have time to say ‘Stop!’"
John Bradley on Samwell Tarley: "He sees with his own eyes, and is kind of connecting this to his own set of emotions"
Why did the Season 8 premiere feel so underwhelming? : "The episode was so packed full of important moments but was done so workman-like, it felt like the show was trying to get all of these scenes done and out of the way as quickly as possible"
Season 8 premiere was blandly decent: "It was less an episode and more a breadcrumb"
This Game of Thrones premiere did something new: "Hitting the accelerator and delivering major plot developments, hurriedly, in its home stretch"
The season premiere was good, but why wasn't it as great as the George R.R. Martin book-based seasons? Season 8 premiere writer Dave Hill: "We toyed with the idea of a cold open"
How was the Night King able to make that symbol on the wall? Why is Daenerys Targaryen being judged on whether she's nice? What does Arya Stark's secret weapon design mean? 60 Minutes goes behind the green screen as Emilia Clarke rides a "dragon"